China Laces Up Its Chuck Taylors China's consumer market is massive, and breaking in isn't easy. Some U.S. products have struggled. But in recent years, an old American sneaker has become an unlikely success story: the Converse Chuck Taylor All Star. Stroll along a street in downtown Shanghai for very long, and you're likely to run into someone wearing Converse Chuck Taylor All Stars. One recent afternoon, Xu Jing was heading back from lunch to her job at an ad company in a pair of raspberry-colored Chuck Taylors. "They have a young image, upbeat and outdoorsy, sporty," said Xu, 27, explaining the appeal. "Young people with an artistic sense prefer Converse." Xu was accompanied by Chen Xiaolei, a co-worker who owns three pairs of Chuck Taylor high-tops. "The shoes are pretty light, good looking, they go with skinny jeans," said Chen. "Nowadays, young people like these shoes because they're fashionable." The canvas-and-rubber shoe that dates to 1917 Massachusetts is now considered reasonably cool among 20-somethings in Shanghai. Even some seniors wear them. Xuan Zhihui, a 62-year-old retiree from a state-run factory, strolls past the city's glass-and-steel towers in brown, 15-year-old high tops her daughter handed down to her. Last year, about 5 million pairs of Chuck Taylors were sold in China — not counting all the fakes. That's not a huge number in this giant market, but it's up 50 percent from 2007. To understand the shoe's emerging popularity here, it's worth looking at how its image has morphed over time. The Chuck Taylor spent its first decades as a hoops sneaker. When Wilt Chamberlain scored 100 points in a single game in Hershey, Pa., in 1962, he was wearing Chuck Taylors. In the 1970s, punk rockers began adopting the shoe: The Ramones wore Chuck Taylors. As did Kurt Cobain of Nirvana in the 1990s. The shoe finally arrived in China in 1993, and Chinese rockers followed the fashion lead of American groups they admired. Yang Haisong sings with the Beijing indie band P.K.-14. He's been wearing Chuck Taylors for years. Yang thinks they are popular because of their price and image, and the sense of individuality that comes with the shoe's variety of colors and styles. "It's quite cheap compared with Nike or Adidas," he says. "The second reason is people like to look back." It's retro. That stripped-down look contrasts with the prevailing trend among increasingly wealthy Chinese consumers: the rush for showy status brands like Louis Vuitton bags and Bentley sedans. And Chuck Taylors are comparatively affordable. Pairs sold for as little as $35 during the recent Chinese New Year celebrations. Until relatively recently, Converse licensed its brand here to a Taiwanese company that marketed the shoes as sportswear. 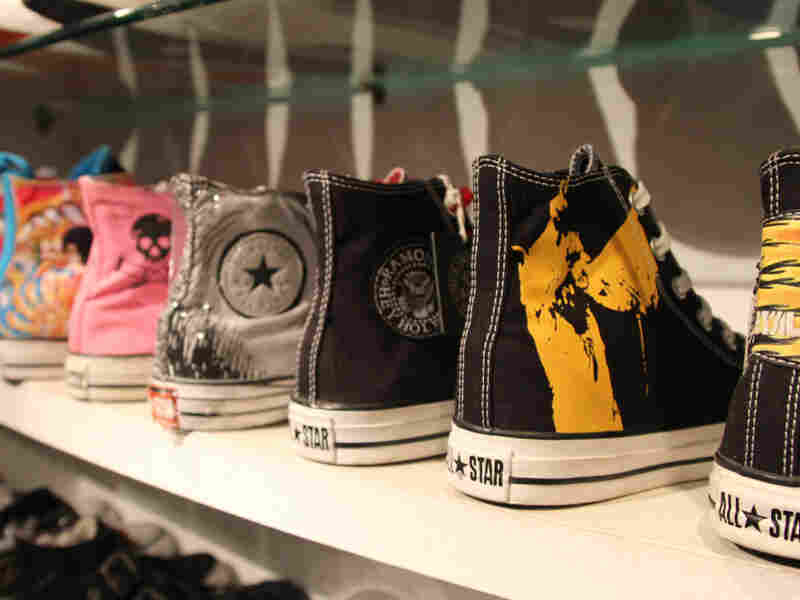 In 2007, Converse took the brand back and began emphasizing a more casual, youthful image. My Tee in Shanghai carries loads of limited edition Chuck Taylors from cities in Japan and New York. Owner Kenny Lee considers some of them museum pieces and has refused to sell them despite offers of up to $3,000. Steve Parker, vice president and general manager for Converse Asia Pacific, says the company partnered with street artists and built on existing, influential customers like Yang. Converse underwrote a tour for P.K.-14 and another Chinese band, Queen Sea Big Shark. "We put them on a bus. I think they traveled through nine different provinces, and it ended up in a big party in a show in Beijing right at the time of the Olympics," Parker says. Converse still gives Yang and his band free sneakers, but it also gets marketing help from people with whom it has no relationship. Kenny Lee runs My Tee in Shanghai. It's a Converse store/museum with no connection to the company. Lee says he carries 1,300 different Chuck Taylors, including limited editions from Tokyo and New York. He shows me a two-toned shoe that fuses styles from the 1960s and the 1980s. I ask how much it costs. "This pair is priceless," he says. "Many people offered me $1,500 or $3,000 and I wouldn't sell. No matter how much money you offer, I am not going to sell." A potential customer, Zhu Lingling, walks in and looks at a fur-lined Chuck Taylor. Zhu used to wear the brand as a college student. She now designs cosmetic packaging and recently had a child. "Now that I work, I don't wear these shoes as often," she says. "But sometimes I still want to chase the memories of my college days." Lee wants $160 for the shoes. Zhu says she loves them, especially the fur, but can't see paying that much for nostalgia.